I have spent my summers at our cottage on Lake Leelanau since birth. The amazing beauty of this area has always fed my soul. When I started painting, I naturally gravitated toward painting landscapes of Leelanau. I also enjoy painting murals. My life long dream of becoming a full time resident of Leelanau County came true in 2008. Now, my inspiration is always at my doorstep. A: I traveled for two months in Europe the summer I graduated from college. The museums in Paris, Florence and Amsterdam opened my eyes to a whole new world. I had never really looked at art before and had never understood how art can touch one's soul. A: I became an artist late in life and was inspired by gardening. I had been a social worker for many years, which I loved, but sometimes felt burdened by. Gardening became a welcome relief. I had never thought of myself as a creative person until I finally realized that my gardens were full of artistic appeal. The urge to paint furniture pieces in my home came upon me and that was satisfying. The move to canvas came very quickly and felt right. A: Art was not a significant part of my life as a child. But the trip to Europe awaked my senses. In particular, a small museum outside of Paris had a Monet collection displayed in chronological order. I walked into the last room, which was semi-circular and filled with many of Monet's water lilies. It took my breath away. To this day, I have a vivid recollection of that experience that I can envision and feel viscerally. 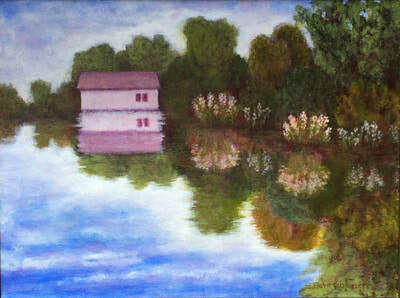 A: Eighteen years ago, when I started to paint, I attend a community art center near where I lived in Ohio. The faculty was amazing and I took studio classes with a variety of talented teachers/artists for many years. Currently, I am inspired by the local artists around Leelanau County, and the beauty of Leelanau County equally inspires me. A: I am primarily an oil painter, and sometimes use acrylics or pastels. But oils are my true love. They blend and melt together, making painting a sensory experience. A: I have been putting more work into my under-paintings (the first layer of paint) such that it defines the painting. A recent piece, "Tuscany Trees", the under-painting determined and predominated the entire painting. A: When people look at my landscapes, I want them to feel like they want to be there. A: I usually always know what I want to paint and have a vision, although sometimes the vision changes as the process unfolds. A: Having much more time to paint - inside, outside, workshops; and painting with other artists whenever possible.